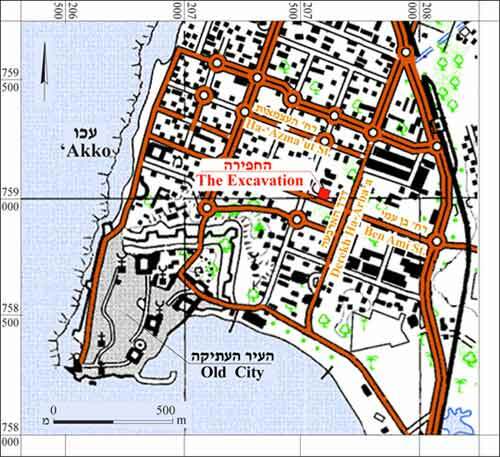 During January 2006, a salvage excavation was conducted in ‘Akko along the northern side of Ben-Ami Street (Permit No. A-4677; map ref. 20759–61/75898–901), prior to construction. The excavation, undertaken on behalf of the Israel Antiquities Authority and underwritten by the Mezudat ‘Akko Gad Company, Ltd., was directed by A. Abu Hamid, with the assistance of Y. Ya‘aqobi (administration), H. Tahan-Rosen and A. Abu Hamid (surveying and drafting), H. Smithline (field photography), C. Amit (studio photography), Y. Gorin-Rosen (glass), H. Tahan-Rosen (pottery and glass drawing), R. Vinitsky (metallurgical laboratory), D. Syon (numismatics) and G. Finkielsztejn (stamped amphora handles). The site was located c. 1.1 km northwest of Tel ‘Akko and c. 1 km east of the sea shore (Fig. 1). Two previous excavations were conducted in the region revealing a temple and local and Attic pottery, lamps, handles with seal impressions, lead weights, ceramic figurines, coins and other small objects that dated from the late third to the late second centuries BCE (S. Applebaum 1986. Excavations at the Site of the New Post Office in Akko. In M. Yedaya, ed. Qadmoniot Ha-Galil Ha-Ma‘aravi. Tel Aviv. Pp. 261 [Hebrew]; Fig. 2: 1959 excavations). In the wake of plans to enlarge the post office building, another excavation was conducted at the site, revealing architectural remains, a section of a road and a water supply and drainage system dating from the third to the first centuries CE (HA 39:14–15 [Hebrew]; Fig. 2: 1971 excavations). Northeast of the current excavation area a plastered room with colored frescos was exposed (ESI 16:27–29). The current excavation area (4×10 m; Figs. 3, 4) comprised two squares, in the west (Sq 1) and the east (Sq 2); three strata (I–III) that were damaged by the installation of modern infrastructure were exposed. Stratum III dated to the Hellenistic period, Stratum II is divided into four phases and dates to the Roman period and Stratum I includes finds from the Crusader and Ottoman periods. The strata are presented hereafter from the earliest to latest. 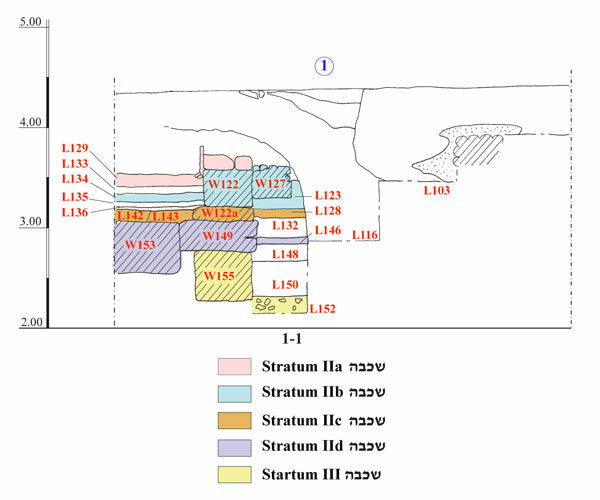 The earliest stratum was only exposed in a fragmented manner in the southwestern corner of Sq 1 (Fig. 5). A corner of a building composed of two walls that were joined together (W139, W155) and built of medium and large ashlars and small and medium fieldstones was exposed. A similarly built wall (W154) abutted the corner of the building from the south. The walls of the building were preserved one–three courses high. Wall 155 was abutted from the east by a floor (L152; see Fig. 4), which consisted of small kurkar stones with yellow kurkar soil that contained much worn potsherds from the Hellenistic period (third–second centuries BCE). Many potsherds from this period were found in all of the excavation strata and should be attributed to this stratum. This stratum, exposed in the northwestern corner of Sq 1, was divided into four phases. Phase IId. Walls (W149, W153) adjacent to each other were constructed in this phase. Their southern part is missing and their continuation to the north was located beyond the limits of the excavation. The walls were built of different size fieldstones. Wall 149 was abutted by a floor (L146; see Fig. 4), located above Floor 152 of Stratum III. 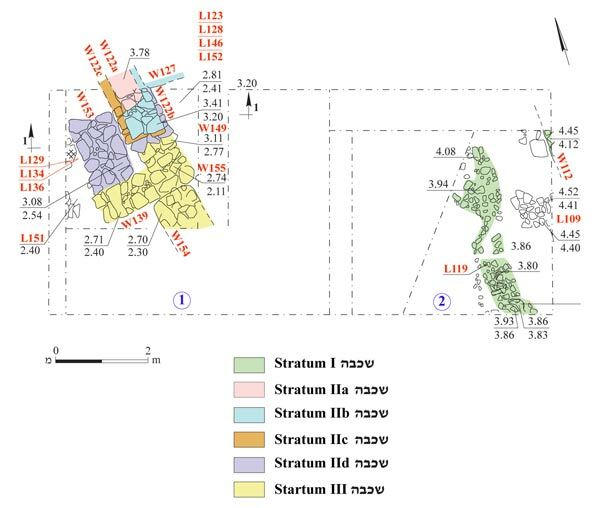 Wall 153 was founded on Stratum III. Phase IIc. A wall (W122c) was built in this phase; it consisted of two rows of dressed stones with a core of small fieldstones. The wall was abutted by two floors, from the east (L128; see Fig. 4) and the west (L136). Phase IIb. Above Wall 122c was another phase (W122b), which was abutted from the east by a wall (W127). Wall 122b, aligned east–west, was preserved to two courses high; the southern part of the wall was missing and its continuation northward was located beyond the excavation limits. Wall 127 in the northern section of the square was preserved three courses high. Part of a floor (L123; see Fig. 4) was exposed between the two walls. A habitation level (L134) was uncovered west of W122b. Phase IIa. The western side of W122b was plastered (W122a) and a floor (L129) was placed above Habitation Level 134. Based on the pottery vessels recovered from Stratum II, it can be dated to the Early and Middle Roman periods. Due to the limited scope of the excavation it was not possible to date each phase separately. 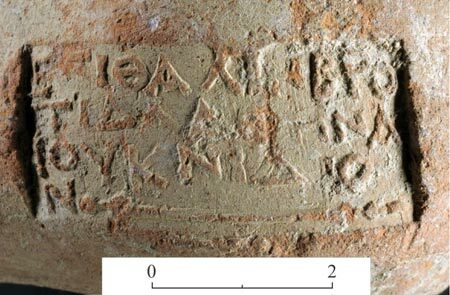 Be that as it may, the clay lamp from the second century CE was found inside Floor 129 of Phase IIa (Fig. 7:9). Numerous items that can be ascribed to Stratum II were found in the areas damaged by the modern installations; these indicate the existence of a bathhouse and include tubuli (Fig. 8:4), pieces of mosaic with plaster, and round ceramic bricks that were probably parts of columns that supported the floor of the caldarium. The layer, found in the eastern part of Sq 2, was severely damaged by modern infrastructures. A wall (W112) that continued beyond the limits of the square was exposed in the northeastern corner. The wall, built of medium-sized fieldstones, was preserved two courses high. A concentration of fieldstones (L119), mixed with fragments of pottery vessels, iron nails, arrowheads, olive pits, animal bones and jaws, was found in the southwest. Most of the pottery vessels, among which the ‘Akko bowls’ are prominent, dated to the time of the Crusader Kingdom of Acre (thirteenth century CE); this seems also to be the date of W112. Several potsherds in the same level date to the Ottoman period and probably belong to a later disturbance. Fragments of numerous pottery vessels characteristic of the Hellenistic period were found, including bowls (Fig. 6:1–6), cooking pots (Fig. 6:7, 8), a krater (Fig. 6:9), jars (Fig. 6:10–12), a jug (Fig. 6:13) and a stirrup-shaped bottle (Fig. 6:14). The pottery from the Roman period included a bowl (Fig. 7:1), a cooking pot (Fig. 7:2) and especially fragments of jars (Fig. 7:3–8) and lamps (Fig. 7:9, 10). 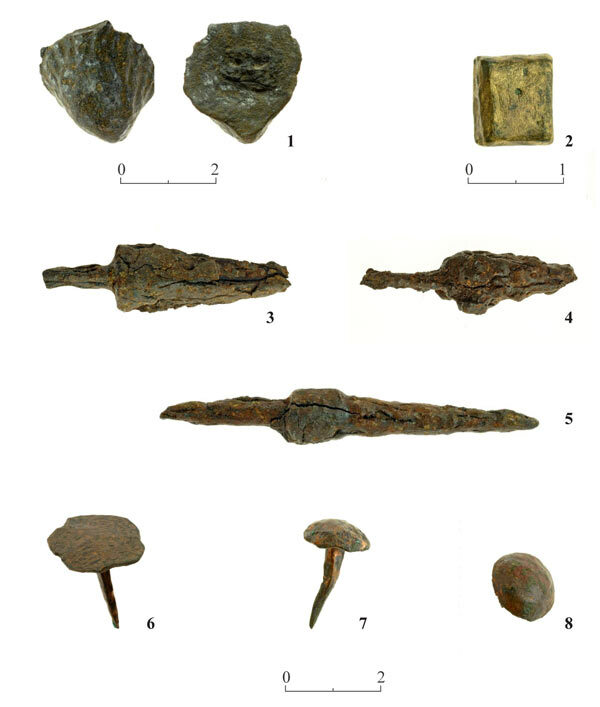 The loci disturbed by new construction contained some objects worthy of mentioning, including a ceramic loom weight that should probably be dated to the Hellenistic or Early Roman periods (Fig. 8:1); a bone disk (Fig. 8:2) and a fragment of figurine depicting an image wrapped in a robe (Fig. 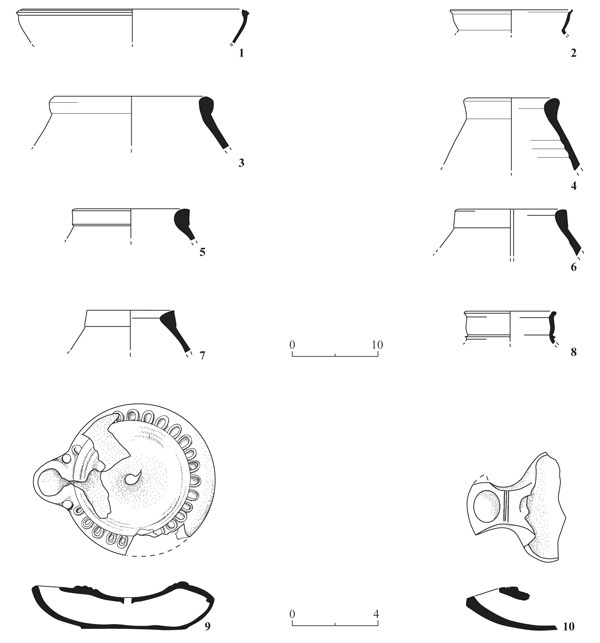 8:3), which joins the multitude of figurines dating to the Hellenistic period (third–second centuries BCE) that were found at the sit in previous excavations (Messika N. 1996. Terracotta Figurines from ‘Acco in the Persian and Hellenistic Period, the Sixth Century to First Century BCE. M.A. Thesis, Hebrew University of Jerusalem. Jerusalem. P. 137 [Hebrew]). Other finds included a lead weight (?) that was probably cast inside a shell (Fig. 9:1), dating to the Early Roman period; a copper weight in the shape of a cube (2.73 grams; Fig. 9:2); pyramidal arrowheads that should probably be dated to the Crusader period (Fig. 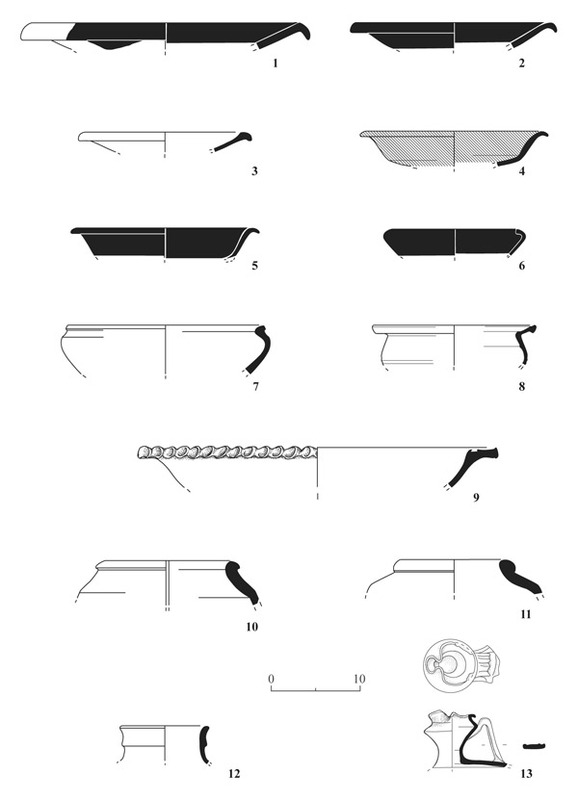 9:3–5), nails (Fig. 9:6) and tacks (Fig. 9:7, 8). Six stamped amphora handles were found, all from disturbed loci and dating from the end of the third to the beginning of the first centuries BCE. Five of the stamped handles originated from Rhodes and one handle came from Knidos (Finkielsztejn below). Coins were also recovered from disturbed loci, ranging in date from the Hellenistic (early second century BCE) to the Late Roman (early fourth century CE; Syon below) periods. The amount of glass found is considerable in light of the limited area excavation (Fig. 10). The glass fragments mainly represent the time period between the late second and the early second centuries CE, along with several fragments from the Late Roman and Byzantine periods. Most of the glass was found in disturbed loci and several fragments were found inside the fill of a floor (Gorin-Rosen below). The limited excavation area and the severe modern damage hamper our understanding of the nature of the finds and how they relate to the finds from earlier excavations. The absence of remains from the Byzantine and Early Islamic periods stands out conspicuously in the settlement sequence revealed in the excavation and this may be related to a change in the city’s borders. 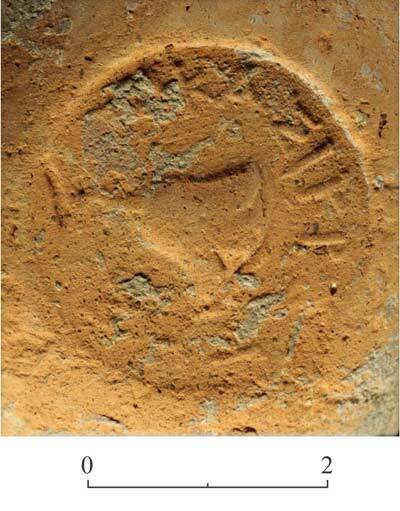 The pottery discovered is identical to the finds from previous excavations at ‘Akko. Remains from the Hellenistic and Roman periods were exposed at nearby sites, such as the courthouse (ESI 13:22–24). 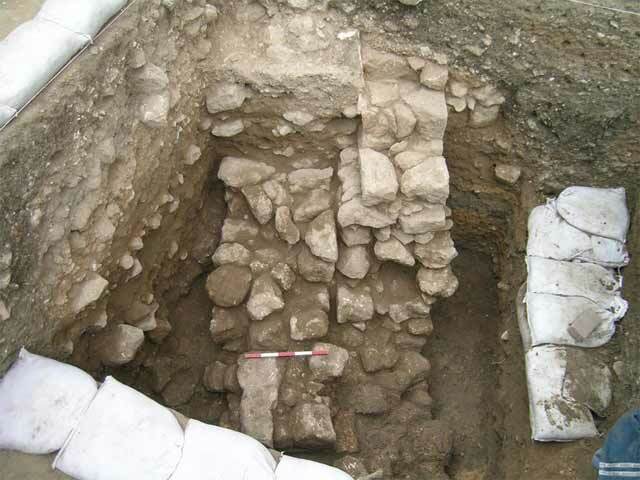 The evidence of a Roman period bathhouse at the site is of great importance. Most of the Crusader ceramic finds, the ‘Akko bowls’, were discovered in a disturbed section in the eastern part of the excavation area, but they are indicative of some activity that took place in the region at that time. Twelve coins were found in the excavation, five of which can be identified. Of the seven remaining coins, three can be dated to the Hellenistic period, based on the sloping cross-section of the coin. Seventy-two glass fragments were found in the excavation, of which c. 40 are indicative. In light of the nature of the material, the variety and the periods it represents, a relatively large group of vessels is presented here, which mostly represents the early phases of the assemblage. The Hellenistic Period. This period is represented by bowl fragments. A rim fragment of a bowl is made of cast, colorless glass (L108; Fig. 10:1), with a thick wall and decorated with horizontal grooves on the inside below the rim. The ridge above the upper groove is decorated with vertical engraving, forming a crenellated or bead-like pattern. Bowls of this type were found at several sites, e.g., Caesarea, Ashdod, Maresha, Beirut and Delos (Israeli Y. 2008. The Glass Vessels. In J. Patrich, ed. Archaeological Excavations at Caesarea Maritima: Areas CC, KK and NN. Final Reports I: The Objects. Jerusalem. Pp. 369–418, especially pp. 370, 396, No. 2, and references therein). A fragment of a large elliptical cast bowl has a thick wall that is decorated with horizontal stripes engraved on its outer, lower part (L146; Fig. 10:2). The decoration consists of a pair of stripes, each composed of a broad horizontal stripe flanked by thin stripes on either side. The bowl is made of colorless glass with a greenish tinge. This type dates to the late second and early first centuries BCE. A fragment of this bowl type was found in ‘Akko, in the excavations at the courthouse parking lot (ESI 19:12*–14*, Fig. 22:2). Another fragment (L116; Fig. 10:3) from the Late Hellenistic period belongs to a bowl of colorless glass that is decorated with a pair of thin stripes etched on the outside of the rim and a broad horizontal groove on the inside of the wall. The Early Roman Period. 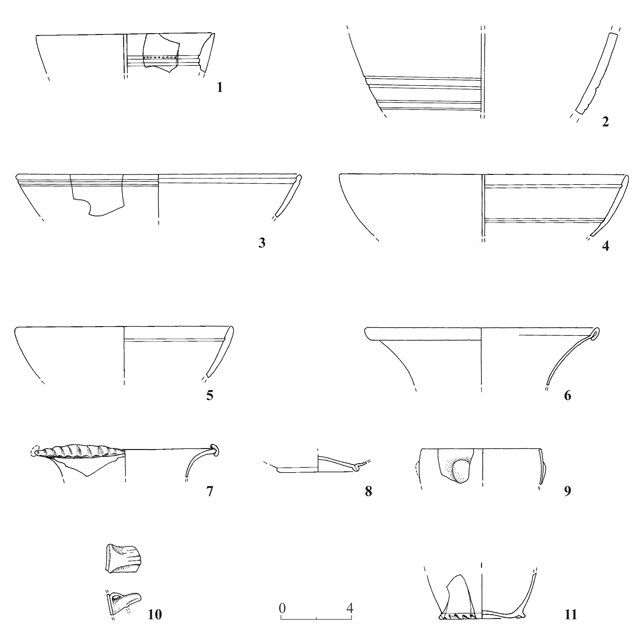 The early phase is represented by cast bowls decorated with two horizontal stripes engraved on the inside of the wall, one below the rim and the other further down the wall toward the base (L131; Fig. 10:4, 5). The bowl in Fig. 10:4 is made of honey brown glass and the bowl in Fig. 10:5 is of colorless glass with a greenish tinge. These bowls are characteristic of the late first century BCE and the first half of the first century CE. The end of the period, the late first and early second centuries CE, is represented by blown vessels, among them a bowl of colorless glass with a hollow outwardly folded rim (L115; Fig. 10:6), and a bowl of greenish blue glass with a rounded and everted rim adorned with an addition of a glass stripe decorated with vertical indentations (L131; Fig. 10:7); this type is well-known from assemblages dating to this time period. A base of colorless glass (L131; Fig. 10:8) might belong to bowls such as the ones described above (Fig. 10:6, 7). The mold-blown vessel (L124; Fig. 10:9) is made of colorless glass and has a pattern of round bosses on it. Its rim is cut-off and polished. Mold-blown cups decorated with bosses resembling the almond fruit are very common in this period; however, the decoration on this fragment is rounder and different in shape. In any event, this vessel should be ascribed to the first or early second centuries CE. A small horizontal handle made of colorless glass (L116; Fig. 10:10) also belongs to this period. The Late Roman Period is represented by a fragment (Fig. 10:11) that belongs to a cup or bowl and is adorned with small feet around the base that are formed by pinching. 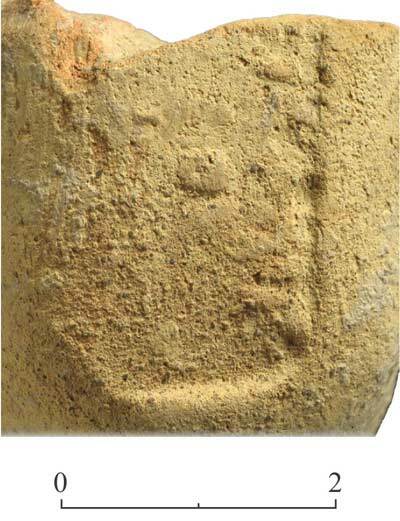 This type is characteristic of the Late Roman period and a very similar fragment was found in an excavation in ‘Akko (ESI 19:12*–14*, Fig. 22: 3). The Byzantine Period is represented by two fragments, one of a wine goblet stem and the other is a green glass tessera (not drawn). In addition, fragments of glass industrial debris were found, including raw glass, pieces of debris that were melted in a furnace and pendants. The debris was found in loci with vessels that dated to the Late Hellenistic and Early Roman periods. The glass vessels and debris from this excavation contribute to the expansion of our knowledge regarding the glass industry in ‘Akko at the end of the Hellenistic and in the Early Roman periods. 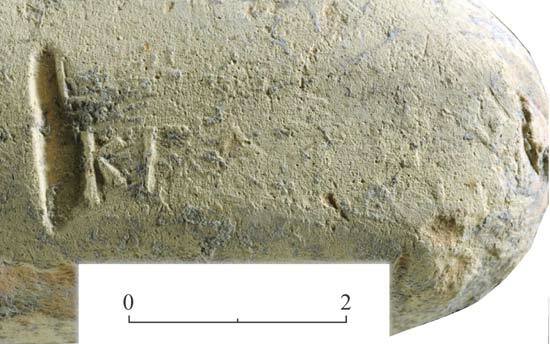 Five out of the six stamped amphora handles uncovered in the excavation are of Rhodian origin, and the last one is a well-impressed stamp of Knidian origin. Even such a small sample shows the ratio, which is representative of what is known from larger corpuses in Israel during the third–second centuries BCE. The stamps cover most of the period phases when stamping handles was prevalent. 2. 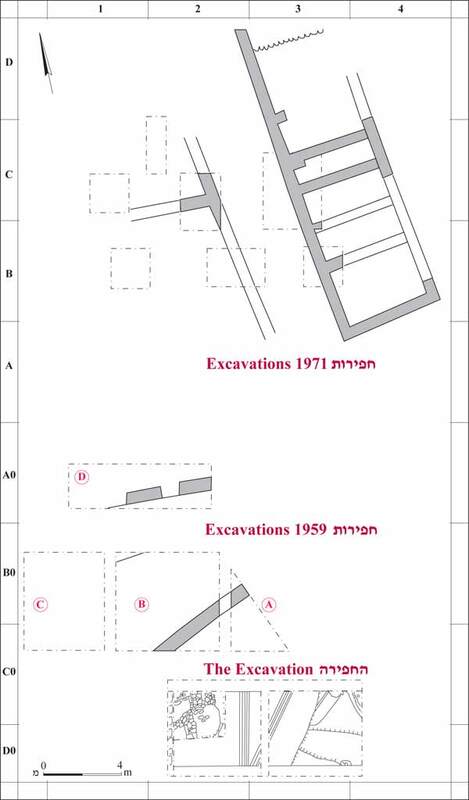 The excavation area and previous excavations, plan; based on the IAA archive. 5. Square 1, the northwestern corner, looking northwest.